Mosquito NFII DD748 crashed in the North Sea 30/7-1943. The aircraft belonged to RAF 25 Sqn Fighter Command. T/O 22:30 Church Fenton. OP: Intruder to Westerland. Shortly after take off and only a few miles out to sea Pilot F/Lt Edred R.F. Cooke called base to report that he would return due to engine problems. After that nothing was heard. The aircraft crashed into the North Sea 15 miles east of Hornsea. Pilot F/Lt Edred R.F. 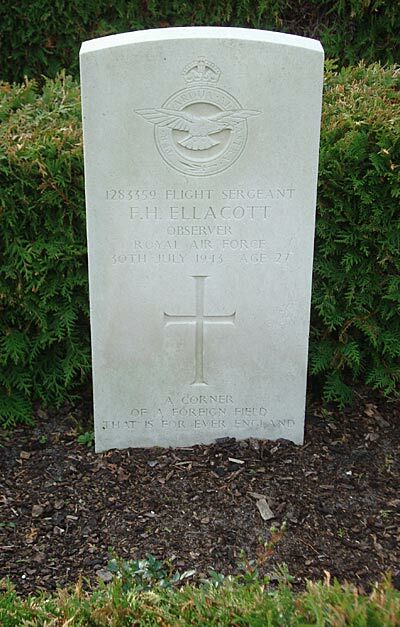 Cooke has no known grave and is commemorated on the Runnymede Memorial while the body of Observer F/Sgt Frederick H. Ellacott was found washed ashore near Lakolk seaside hotel on 17/8 and was laid to rest in Kirkeby cemetery, presumably on 19/8-1943. Sources: AIR 27/306+16/889, UA, KK, CWGL.